Dr. Barbara R. Schirmer has worked in PK-12 and higher education since graduating from the University at Buffalo, State University of New York with a B.S. degree in elementary education. She also has an M.Ed. degree in teaching students who are deaf and hard of hearing from the University of Pittsburgh and Ed.D. degree in education with focus on language and literacy development from the University at Buffalo. She has been a professor and administrator at several institutions including the University of Wisconsin-Milwaukee, Lewis & Clark College, Kent State University, Miami University, University of Detroit, Defiance College, and The College of Saint Rose. Her administrative experience includes being a Provost and Vice President for Academic Affairs, Dean, and Department Chair. She has authored 5 books, 35 articles published in refereed journals, and several book chapters, and has made dozens of conference presentations. 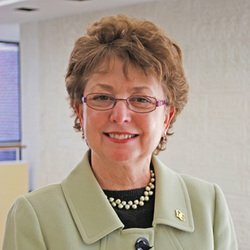 Her current research interests involve a series of studies designed to improve the reading fluency of deaf students, investigation of research methodologies that lead to the identification of evidence-based instructional practices, and strategies to assist campuses that are experiencing discord and dissension. Schirmer, B. R. (2018). Framework for Conducting and Writing a Synthetic Literature Review. International Journal of Education. Schirmer, B. R., Lockman, A. S., Schirmer, T. N. (2018). Relevance of the IES/NSF Protocol to Identification of Evidence-Based Practices. Journal of Educational Research and Practice. Schirmer, B. R., Lockman, A. S., Schirmer , T. N. (2016). Identifying evidence-based educational practices: Which research designs provide findings that can influence social change? . Journal of Educational Research and Practice. Schirmer, B. R. (2010). Teaching the Struggling Reader. Schirmer, B. R. (2018). Investigation of the IES/NSF Protocol for Identifying Promising Evidence through Lines of Research Inquiry. Schirmer, B. R., Lockman, A. S. (2017). How important is methodology in identifying evidence-based practices? . Schirmer, B. R. (2016). Repeated reading fluency intervention on the reading achievement of high school deaf readers.